This post build on the Re-Learning Backbone.js series. We are going to start out with an example that doesn’t function correctly. Don’t worry, I believe it’s important to show you the evolution of creating an application from the very beginning to a working version. We will take very small steps to get where we need to go. 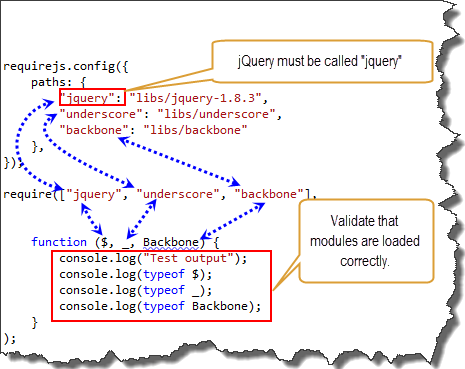 We also need the following libraries jQuery, Backbone.js, Underscore.js and Require.js. These libraries should be stored in the “libs” directory. First create two files. The first file will be called Require1.html and this file will be in the root directory. Add the following code to the file. 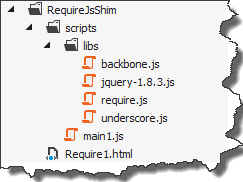 All the HTML file does is tell RequireJS to execute the main.js file in the script directory. The second file will be called main1.js and this file will be in the “scripts” directory. Add the following code to the file. In this post I will discuss how scripts are loaded and executed by the browser. It’s common to have scripts loaded by the browser by using the script tag (<script>) with a src (source) attribute. In the old days, the early versions of IE, FireFox, and Chrome, the script tags would load and execute synchronously. Today newer browsers support the ability to download scripts in parallel. The scripts are still executed in order they are declared. In the following example we will load 6 scripts (note the script at the bottom). The order of the scripts does matter. Since backbone.js depends on underscore.js, underscore.js will be declared before backbone.js. Here’s the code that will be used to help us understand script loading.